Lucy Stelle Brown is born in New York City, New York. William graduates from Yale University with a degree in Naval Architecture. 1907-08 William studies at the Art Students League in New York. Blanche Lazzell and Georgia O'Keeffe are also students at this time. William goes to France where he will spend five years. He studies at the Académie Julian with Raphael Collin and in the studio of Louis Biloul. Lucy Brown spends the summer in Provincetown studying at Charles Hawthorne's Cape Cod School of Art. 1910 William travels to Spain with friends and fellows artists George Biddle and Waldo Pierce. The three Americans study in Madrid and copy paintings by Diego Velázquez at the Prado Museum. Lucy studies at the Art Students League in New York City. 1913 William enrolls at the École des Beaux-Arts in January where he studies with Jean-Paul Laurens. Lucy goes to Paris to attend the Académie Julian. William and Lucy meet. The L'Engles seek safety from the war in Marseilles, where they have their first daughter, Madeleine (Mady), in March. The family returns to New York by the summer. The family spends the first of many summers in Provincetown. Lucy studies with C.W. Hawthorne (through the summer of 1918). The couple becomes good friends with William and Marguerite Zorach, who are also spending their first summer in Provincetown. Each of the young couples identifies the Cubist spirit in the other and may have known each other from Paris. Marsden Hartley has a successful summer of painting in Provincetown as well. The L'Engles become involved with the theater group, The Provincetown Players, who were in their second season. Birth of the couple's second daughter, Camille (Cammie) in New York City. William joins The Beachcombers Club of Provincetown, a gentlemen's club dedicated to art and literature. Lucy first exhibits at the annual exhibition of the Provincetown Art Association (PAA). She exhibits four works titled: Over the Bay; The Black Shawl; The Yellow Scarf; Portuguese Girl. She establishes a studio at Players' Wharf. William has a studio in a house away from the activity. Lucy and William each exhibit two paintings at the Society of Independent Artists and again in 1921-1923 and 1925. Lucy exhibits alone in 1920 and 1936. William exhibits a portrait in the National Academy of Design's annual exhibition in March-April. William first exhibits at the PAA's annual exhibition and his portrait of a fisherman Old Ben is noted in American Art News (July 12, 1919). Lucy exhibits a portrait and a still life. Lucy and Marguerite Zorach cause a local stir when they arrive for the summer in Provincetown with their hair bobbed, the local newspaper takes note. William has an exhibition of 49 paintings, including 18 portraits, 13 figurative works, and 18 landscapes at Kingore Galleries, 668 Fifth Avenue, New York, from November 30 through December 14. The exhibition is organized by Christian Brinton and is fulsomely reviewed in The New York Times and The New York Tribune on December 5th. The Tribune calls William "a robust, invigorating type, decisive in his color, setting his forms boldly upon the canvas and showing skill in the definition of traits of character." Since the L'Engles return from Europe in 1915, William spends the winters in New York as a portrait painter and the list of portraits at the Kingore exhibition included the Brown family, the Iselin Family, Rex Fincke (tennis player), and Wilbur Daniel Steele (author). William exhibits The Decision and Lucy exhibits Dream and Sails at the PAA's annual exhibition. Given Christian Brinton's involvement with the Société Anonyme, the L'Engles likely visit the group's galleries on 47th Street in its first year of exhibitions, which include artists Marcel Duchamp, Kurt Schwitters, Paul Klee, Wassily Kandinsky, Marsden Hartley, and Joseph Stella. 1922 Lucy has an exhibition of 18 modernist paintings at the Art Center Building in New York, 65 East 56th Street. The exhibition is reviewed in American Art News (March 4, 1922) and quotes Lucy describing her paintings as "a play of forms and colors - imaginative rather than realistic - emphasizing the abstract." Lucy and William participate in the PAA's annual exhibition. 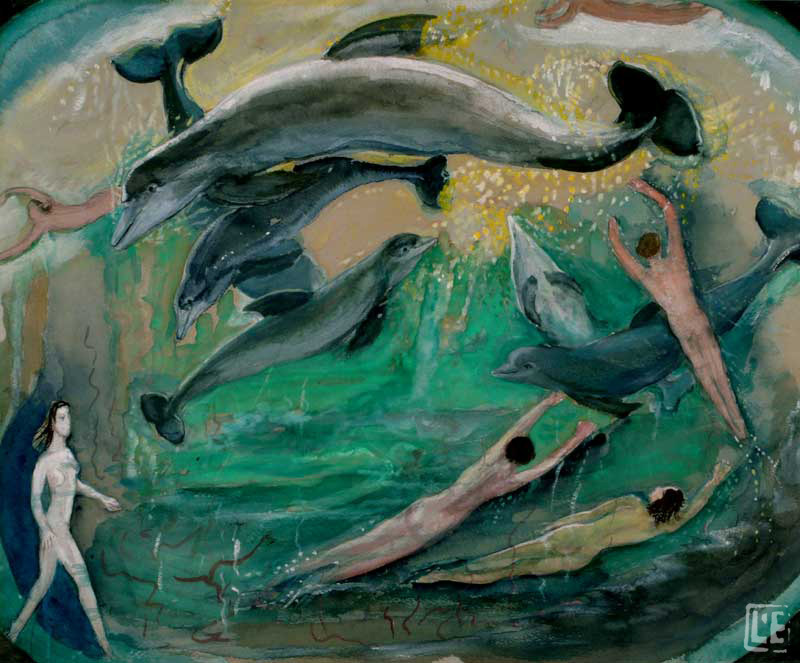 American Art News (July 15, 1922) notes, "The Modernists have been given a generous space, William and Marguerite Zorach, Agnes Weinrich, Karl Knaths, William and Lucy L'Engle, and J. Floyd Clymer showing individualistic works." William and Lucy exhibit at the Salons of America (which they do again in 1925 and 1934, Lucy exhibits without William in 1931). Amidst the modernists, Lucy's Quilts is singled out in American Art News (October 21, 1922) for its "highly personal way of looking at white houses." The L'Engles spend the summer in Cavalaire, a seaside town in the South of France, with fellow Provincetowners, the authors Hutchins Hapgood and Neith Boyce. Albert Gleizes and his wife, who also have a house in Cavalaire, are regular visitors to the L'Engles' rented home. In the fall the L'Engles go to Paris so Lucy can formally study with Gleizes through the winter of 1924. The L'Engles acquire the Shebnah Rich House on Long Nook Road in Truro. William exhibits Mediterranean Fisherman and Lucy exhibits Cagnes at the PAA's annual exhibition. Lucy becomes a founding member of the New York Society of Women Artists (NYSWA). Other Provincetown members included: Agnes Weinrich, Blanche Lazzell, Ellen Ravenscroft, and Marguerite Zorach, who becomes the group's first president. The membership is limited to 30 artists. William serves on the jury for the PAA's annual exhibition. Neither L'Engle exhibits work in the exhibition. Lucy is included in the exhibition Exposition International d'Art d'Aujourd'hui (International Exposition of Art of Today) which opens in December in Paris. The exhibition organized by Polish painter Victor Poznanski, a student of Gleizes, shows the international spread of Cubism. Léger, Gleizes, Picasso, Arp, Ernst, and Miró participate. The exhibition includes the work of 60 artists from many nations. The Americans were the third most represented country with six artists: Blanche Lazzell, Patrick Henry Bruce, Florence Henri, Lucy L'Engle, Gerald Murphy, and E. Ambrose Webster. Lucy exhibits Panneau pour salle de musique (Panel for a Music Room). 1926 NYSWA has its first exhibition in April at the Anderson Galleries in New York. William serves on the jury for the PAA's annual exhibition. Lucy's painting Street is reproduced in The New York Times's coverage of the group exhibition. 1927 William and Lucy serve on the jury and exhibit in The First Modernist Exhibition of the PAA in July. Lucy exhibits two abstract still lifes and William exhibits a circus scene. Lucy exhibits in the NYSWA's second annual exhibition in March. Her painting Lady Slippers is reviewed in The New York Times. She is elected an officer of the group, a role she maintains through 1934. William is elected a trustee of the PAA. Both William and Lucy serve on the jury for the PAA's Modernist annual exhibition, which takes place in July. Lucy creates the cover for the exhibition catalogue- a Gleizes-influenced composition. William exhibits a circus subject and Lucy exhibits a painting of Diana. Each work is noted in The New York Times coverage of the July exhibition. William exhibits at the Corcoran Gallery of Art's biennial (which he also does in 1939). 1929 William and Lucy both serve on the jury for the PAA's Modernist annual exhibition. 1930 William and Lucy serve on the jury for the PAA's Modernist annual exhibition. William and Karl Knaths hang the exhibition. Each L'Engle exhibits two works. William and Lucy exhibit in Provincetown Group Show at GRD Gallery in New York in February. The exhibition is organized by Agnes Weinrich and includes Charles Demuth, Oliver Chaffee, Karl Knaths, the Zorachs, Jack Tworkov, Janice Biala, Niles Spencer, and E. Ambrose Webster. Lucy is one of seven artists (including Marguerite Zorach) of the NYSWA to be invited to exhibit at the Art Association of Newport in July. 1931 Lucy participates in a group exhibition at Weyhe Gallery with paintings and drawings. William serves on a small jury for the PAA's Modernist annual exhibition and exhibits Figure Composition. Lucy exhibits three works: Grotesque, Dan in Boat, and Study in Movement. 1932 Lucy's modern canvases are noted by The New York Times in the NYSWA's first exhibition in their permanent gallery in the Squibb Building in New York in January. William exhibits Two Dancers in Black and Rest at an exhibition of work by men in the NYSWA's gallery in March, which are both noted in The New York Times as "excellent figure themes" (March 5, 1932). William and Lucy participate in the exhibition Theatre in Art at the Sidney Ross Gallery in New York in April-May. William's Two Dancers in Black and Lucy's Dance Composition are singled out in The New York Times review (April 21, 1932). William serves on the jury for the PAA's Modernist annual exhibition. Lucy exhibits two paintings from their recent trip to Mexico: Plaza, Taxco and Domes of Cholula. William exhibits a painting titled Composition. William has an exhibition of paintings, watercolors, and drawings at Montross Gallery, New York in March. The exhibition includes Mexican and New England subjects, as well as drawings of dancers. Art News (March 5, 1933) reproduces The Cove, a painting of bathers at a pier, and Town and Country (March 15, 1933) reproduces Peons, an image of workers inspired by the L'Engles' trip to Mexico in 1932. The exhibition is given a full review in The New York Times (March 5, 1933). William exhibits the watercolor Dance Group in a traveling group exhibition The Dance in Modern Art, which opens at the Reinhardt Galleries in New York in December. 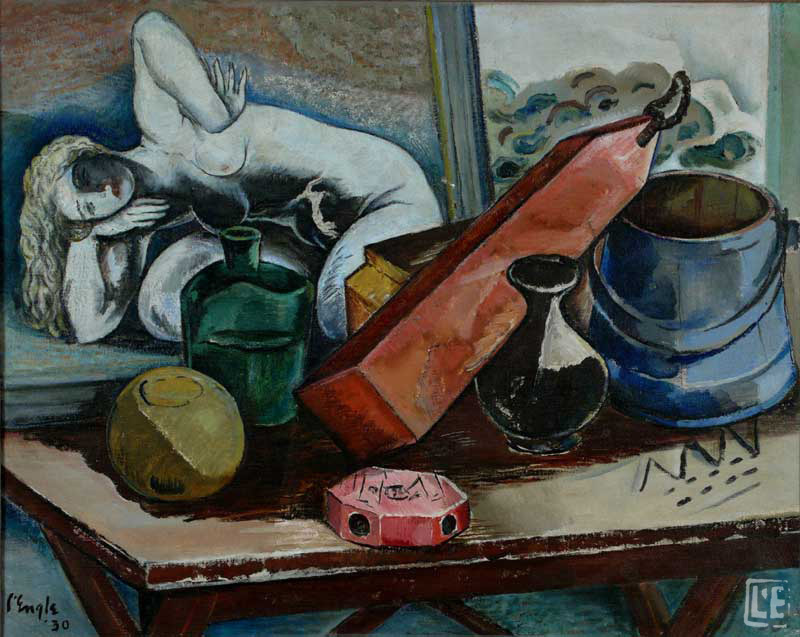 The exhibition is organized by the College Art Association and includes both American and European artists, including: Ivan Albright, Milton Avery, Arthur B. Davies, Guy Pène du Bois, Ernest Fiene, Robert Henri, Yasuo Kuniyoshi, Reginald Marsh, Henri Matisse, Pablo Picasso, Henri Toulouse-Lautrec, and Max Weber. William L'Engle exhibits Fishermen and Street Music in the PAA's Modernist annual exhibition. Lucy exhibits two paintings and four drawings. 1934 William and Lucy participate in the Pennsylvania Academy of the Fine Arts' annual exhibition. Lucy exhibits in the annual exhibition of the NYSWA in February at the Squibb Building. Lucy exhibits her prints in a group exhibition at Weyhe Gallery in May. Lucy exhibits in the 10th annual exhibition of the NYSWA at the Squibb Building in February. At the PAA's Modernist annual exhibition, William exhibits Track Meet (now in the Town Collection of Provincetown) and Lucy exhibits 5 paintings titled: Car Barns, New York; Clam Diggers; Houses; In Wellfleet; Church Tower, Wellfleet. 1936 William exhibits at the Pennsylvania Academy of the Fine Arts and the Art Institute of Chicago. Lucy exhibits in the annual exhibition of the NYSWA in January at the Squibb Building. One of Lucy's eight entries in the PAA's Modernist annual exhibition, The Street, is reproduced in The New York Times (August 16, 1936) in an article on the Provincetown art scene. William serves on jury for the Combined (Modernist and Conservative) exhibition of the PAA, where the modernists hang their art on one side of the gallery and the conservatives on the other. Both William and Lucy exhibit paintings on the modern wall from their recent trip to Cuba. Lucy exhibits in the NYSWA's annual exhibition at the Squibb Building in January. Yale University acquires A Hill Town by William. 1938 Lucy exhibits a Cuban landscape at the NYSWA's annual exhibition at the Squibb Building in February. William exhibits 1 painting and Lucy exhibits 6 in the PAA's annual exhibition. William is selected to participate in the New York World's Fair exhibition Art Today and exhibits the painting Cement Workers. The Metropolitan Museum of Art acquires William's watercolor, Figure Composition, as part of its effort to acquire modern American paintings. The work goes on view in the Metropolitan Museum's Special Exhibition Gallery from November to January 1940 in the exhibition of new acquisitions, Paintings by Modern American Artists. Lucy's lithographs receive attention in The New York Times in a group print exhibition by twenty artists at the Grant Studios, New York in January. William and Lucy exhibit in the PAA's annual exhibition in July and Lucy exhibits two works - Winding Road and After the Fair - at the PAA in August. William and Lucy spend the winter in St. Augustine, Florida. William holds an active role in the Arts Club of St. Augustine in the 1940s, advocating the importance of modern art. Under his guidance the group's exhibitions became more diverse in style, including a Blanche Lazzell print show in 1944. William has an exhibition of oil paintings at Georgette Passedoit Gallery, New York from March 11 through 23. A portrait of his daughter titled Mady is reproduced in The New York Times (March 17, 1940). Fish Composition is reproduced in Art News (March 16, 1940). Lucy exhibits a landscape with the NYSWA at the American Art Today Building at the New York World's Fair from September 24 to October 11. She also participates in the group's annual exhibition in February at the Grant Studios. 1941 Lucy's landscape of Provincetown dunes is noted in The New York Times review of the NYSWA annual at the Riverside Museum in September. 1942 The Whitney Museum of American Art purchases a painting by William from the PAA's annual exhibition. 1945 William curates an exhibition on Martin Johnson Heade, then in obscurity, at the Arts Club of St. Augustine. The exhibition includes 27 paintings and sketches from Florida collections. Lucy receives recognition in The New York Times (Oct. 14, 1945) for her watercolor On the Jetty in the NYSWA's annual exhibition at the Riverside Museum. 1946 In November, William and Lucy participate in an exhibition of the PAA at Jacques Seligmann Gallery in New York. Lucy and William both exhibit abstractions and landscapes. 1947 Lucy participates in a four-woman show at the Studio Gallery in New York. 1949 Lucy's abstractions at the NYSWA's annual exhibition at the Riverside Museum in November are noted in The New York Times (Nov. 13, 1949). 1951 Lucy has a solo exhibition of paintings, including many Florida gouaches, at the Wellons Gallery, New York in October. William and Lucy have a joint exhibition at Bodley Gallery, New York in October. Lucy exhibits collages of broken antique glass and William exhibits watercolors of Romanesque sculpture he saw in France and Spain. 1960 Memorial exhibition for William at the Provincetown Art Association and Museum. Lucy shows William’s work at his studio, now the L’Engle Studio Gallery. Lucy shows at Lynn Kottler Gallery, N.Y.
Lucy shows “Recent Drawings of Archaic Greek Sculpture” at Gallery of Hotel Barbizon, NYC. Memorial exhibition of William and Lucy L’Engle at the Provincetown Heritage Museum. Exhibition at the Truro Historical Museum: “William and Lucy L’Engle, Two Modern Painters in Truro-1917-1978”. William and Lucy L’Engle exhibition, Provincetown Art Association and Museum. © D. Wigmore Fine Art, Inc.